It was constructed by utilizing part of the cut (Channel) of the original canal dating back to 1764 that passed from this point to join the River Calder near to the Flower Pot. To improve the navigation avoiding the need to travel the shallow stretch of Calder between Shepley Bridge and Ledgard Bridge, the old cut was replaced by the Mirfield Cut which was constructed in 1776 to form a direct route between these two points.. This new direct cut was constructed by William Jessop and John Pinkerton the engineer and contractor, who on completion of the project went on to become the first operators of the yard. 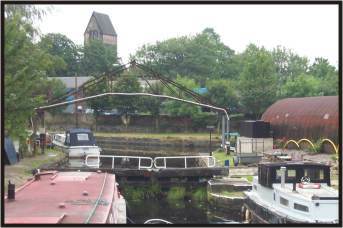 You can find out more about barges and their building in the Made In Mirfield section HERE. On Tuesday, at the Black Bull Inn, Mirfield, T. Tayor, Esq. held an inquest on the body of Lewis Whitaker, a weaver, who had resided at Long wood. The wife of the deceased said that her husband was forty-three years old, and a weaver. He worked at Batley Carr, and was in the habit of going to his work on the Monday morning, and returning on the Saturday night. He left home on Monday, the 13th of January, and did not return on the Saturday, but she was not much surprised at this as he sometimes got drunk and missed his way. 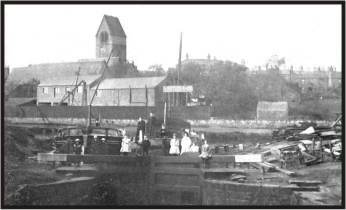 The next witness was James Midwood, of Mirfield, lime-burner, who found the deceased quite dead, on Monday morning, at the top of a lime kiln belonging to Mr. Barker, at Ledgard's Bridge; and the next witness, Maria Croft, of the Bull's Head, Mirfield lane, who said that the deceased was at her house on Saturday evening a little fresh, but he only stayed about twenty minutes. The jury returned a verdict to the effect that the deceased had been accidentally suffocated at a lime kiln. An accident serious nature occurred at Mifield on Wednesday, at half past four o'clock in the afternoon, to John Hirst, spinner of Savile Place. 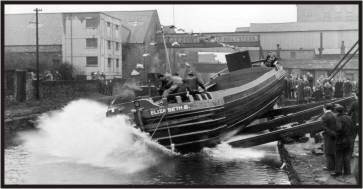 He was assisting some workmen at Mr. Joshua Wheatley's mill at Ledgard Bridge to raise a gasometor. It was being hoisted by ropes, but one broke, and the iron work falling upon Hirst it infiicted very serious injuries. He was much crushed on the body and arms, and sustained a compound fracture of the leg Drs. Rhind and Whalley were called in, and having given the unfortunate man what aid they could on the spot, he was taken by train to Huddersfield, and placed in the Infirmary. Hirst is a widower, and the father of tenchildren.